The School of Journalism and Digital Media, inaugurated in October 2014, the newest in the growing line-up of faculty at the University of The Gambia, offers a competitive programme in journalism with emphasis on practice and professionalism. The hands-on approach prepares students for engagement at the highest levels of delivery whether as reporters, broadcasters, commentators, specialist writers, administrators, or investors in the print and broadcast media domains. The school shares the same campus with the faculty of Law at Kanifing. Admission to the programme at the SJDM is in accordance with the requirements for entry to the University of The Gambia: Minimum of 5 credits ‘O’ level/WASSEC including English with “B” pass in mathematics. Students completing the requirements for the course will earn one of two designations: BA (for those who have pursued course choices preferring print journalism). Students wishing to qualify BSc in broadcasting, with emphasis on related ICT (digital) classes, will be able to pursue a definitive programme in the 2019/2020 Academic Year. My great hope derives daily from the vibrant faces of the students I see overflowing the corridors of our School of Journalism and Digital Media (SJDM) to and from classes or activities. To consider that four years ago there was nothing to speak of regarding professional journalism training in The Gambia, and to see the record already of SJDM interns raising the standards on radio, newspapers, and on social media is quite a miracle. This compounds the excitement with which we anticipate the graduation of the first-ever cohort of journalists at the Convocation slated for January 2019. The coming year brims with progress with a digital laboratory already in operation, and with a wellstocked journalism library, a campus radio station, and a campus newspaper in the making. It is always a pleasure to hear the “SJDMers” describe themselves as a family. And, indeed, we are. We are also pioneers in this cause with the founding fathers and those have laboured through four years, all on-going students, and those coming in now to complete the First Four Years. All the lecturers, administrators, and ancillary staff that have seen us through, like they, are veritable pioneers for having delivered to this hope of changing the face of Gambian journalism forever. 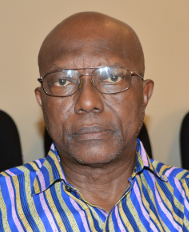 Mr Nana Grey-Johnson is a lecturer at the UTG and serves as dean of the School of Journalism and Digital Media. He studied mass communications and journalism at Lewis & Clark College and Stanford University in the United States of America.